This is the twenty-first in a series of chimerical creatures; the aim is to create an alphabet of fabulous beasts over the coming months. The unicorn is a legendary animal that has been described since antiquity as a beast with a large, pointed, spiralling horn projecting from its forehead. The unicorn was depicted in ancient seals of the Indus Valley Civilization and was mentioned by the ancient Greeks in accounts of natural history by various writers, including Ctesias, Strabo, Pliny the Younger, and Aelian. The Bible also describes an animal, the re’em, which some translations have rendered with the word unicorn. In European folklore, the unicorn is often depicted as a white horselike or goatlike animal with a long horn and cloven hooves (sometimes with a goat’s beard). In the Middle Ages and Renaissance, it was commonly described as an extremely wild woodland creature, a symbol of purity and grace, which could only be captured by a virgin. In the encyclopedias its horn was said to have the power to render poisoned water potable and to heal sickness. In medieval and Renaissance times, the horn of the narwhal was sometimes sold as unicorn horn. In On the Nature of Animals (Περὶ Ζῴων Ἰδιότητος, De natura animalium), Aelian, quoting Ctesias, adds that India produces also a one-horned horse (iii. 41; iv. 52), and says (xvi. 20) that the monoceros (Greek:μονόκερως) was sometimes called cartazonos (Greek: καρτάζωνος), which may be a form of the Arabic karkadann, meaning “rhinoceros”. A one-horned animal (which may be just a bull in profile) is found on some seals from the Indus Valley Civilization. Seals with such a design are thought to be a mark of high social rank. The predecessor of the medieval bestiary, compiled in Late Antiquity and known as Physiologus (Φυσιολόγος), popularised an elaborate allegory in which a unicorn, trapped by a maiden (representing the Virgin Mary), stood for the Incarnation. As soon as the unicorn sees her, it lays its head on her lap and falls asleep. This became a basic emblematic tag that underlies medieval notions of the unicorn, justifying its appearance in every form of religious art. Interpretations of the unicorn myth focus on the medieval lore of beguiled lovers, whereas some religious writers interpret the unicorn and its death as the Passion of Christ. The myths refer to a beast with one horn that can only be tamed by a virgin; subsequently, some writers translated this into an allegory for Christ’s relationship with the Virgin Mary. The unicorn also figured in courtly terms: for some 13th century French authors such as Thibaut of Champagne and Richard de Fournival, the lover is attracted to his lady as the unicorn is to the virgin. With the rise of humanism, the unicorn also acquired more orthodox secular meanings, emblematic of chaste love and faithful marriage. It plays this role in Petrarch’s Triumph of Chastity, and on the reverse of Piero della Francesca’s portrait of Battista Strozzi, paired with that of her husband Federico da Montefeltro (painted c 1472-74), Bianca’s triumphal car is drawn by a pair of unicorns. The Throne Chair of Denmark is made of “unicorn horns” – almost certainly narwhal tusks. The same material was used for ceremonial cups because the unicorn’s horn continued to be believed to neutralize poison, following classical authors. It is clear that Marco Polo was describing a rhinoceros. In German, since the 16th century, Einhorn (“one-horn”) has become a descriptor of the various species of rhinoceros. The famous late Gothic series of seven tapestry hangings The Hunt of the Unicorn are a high point in European tapestry manufacture, combining both secular and religious themes. The tapestries now hang in the Cloisters division of the Metropolitan Museum of Art in New York City. In the series, richly dressed noblemen, accompanied by huntsmen and hounds, pursue a unicorn against mille-fleur backgrounds or settings of buildings and gardens. They bring the animal to bay with the help of a maiden who traps it with her charms, appear to kill it, and bring it back to a castle; in the last and most famous panel, “The Unicorn in Captivity,” the unicorn is shown alive again and happy, chained to a pomegranate tree surrounded by a fence, in a field of flowers. Scholars conjecture that the red stains on its flanks are not blood but rather the juice from pomegranates, which were a symbol of fertility. However, the true meaning of the mysterious resurrected Unicorn in the last panel is unclear. The series was woven about 1500 in the Low Countries, probably Brussels or Liège, for an unknown patron. A set of six engravings on the same theme, treated rather differently, were engraved by the French artist Jean Duvet in the 1540s. Another famous set of six tapestries of Dame à la licorne (“Lady with the unicorn”) in the Musée de Cluny, Paris, were also woven in the Southern Netherlands before 1500, and show the five senses (the gateways to temptation) and finally Love (“A mon seul desir” the legend reads), with unicorns featured in each piece. 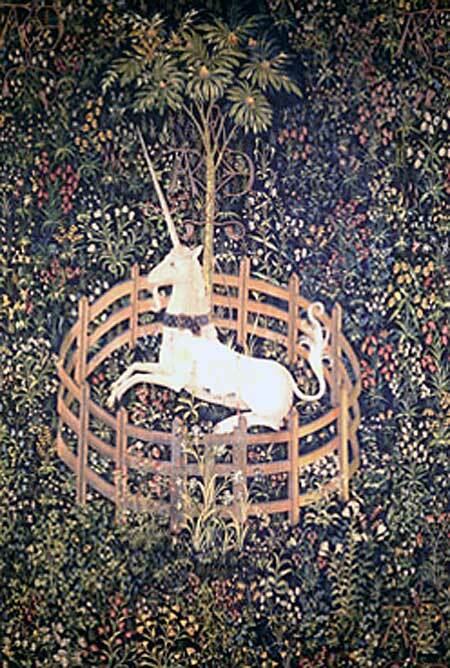 Facsimiles of these unicorn tapestries are currently being woven for permanent display in Stirling Castle, Scotland, to take the place of a set recorded in the castle in a 16th century inventory. A rather rare, late 15th century, variant depiction of the hortus conclusus in religious art combined the Annunciation to Mary with the themes of the Hunt of the Unicorn and Virgin and Unicorn, so popular in secular art. The unicorn already functioned as a symbol of the Incarnation and whether this meaning is intended in many prima facie secular depictions can be a difficult matter of scholarly interpretation. There is no such ambiguity in the scenes where the archangel Gabriel is shown blowing a horn, as hounds chase the unicorn into the Virgin’s arms, and a little Christ Child descends on rays of light from God the Father. The Council of Trent finally banned this somewhat over-elaborated, if charming, depiction, partly on the grounds of realism, as no one now believed the unicorn to be a real animal. You are currently reading Sketchbook Page 26 (revisited): U is for Unicorn at osteography.